Canada has won its third straight Spengler Cup, beating Switzerland 3-0 on Sunday. It’s the country’s 15th time winning the title overall and tying HC Davos for most Spengler Cup titles. Goaltender Kevin Poulin led the game, making 36 saves in the shutout. After a scoreless first period, Zach Boychuk and Maxim Noreau both scored in the second. David McIntyre gave the Canadians a more comfortable lead in the third. Hockey Canada is using the six-team tournament as a final evaluation before deciding on its Olympic roster next month. 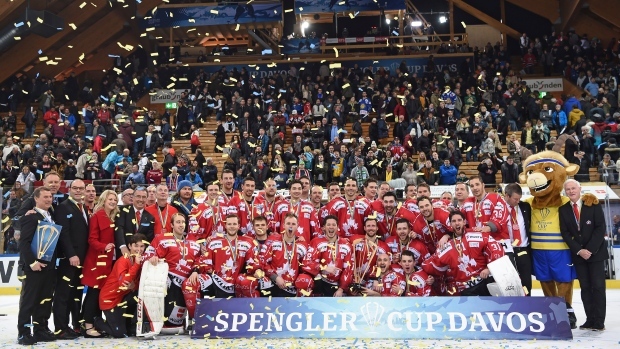 The Swiss National Team secured its spot in the final at this year’s Spengler Cup by winning against Davos 8:3. The hands-down victory only became evident when the home team began to lose strength; Davos was leading 3:2 up until the 37th minute. The initial situation was crystal clear: While the semi-final was Switzerland’s 3rd game in 5 days, for HC Davos it was the 4th game in 72 hours. Even though the physical per-conditions were very different, the home team delivered several spectacular and hard-fought battles for almost two full periods. In the initial phase, Robert Kousal and Brandon Buck both shot the equalizing goal almost immediately. In the 36th minute, Magnus Nygren sensationally put the Davos team in the lead (36.) in a power play situation. However, this was to be their last show of strength. 77 seconds later Davos fell behind when Michael Fora and Dominic Schlumpf both knocked the puck in the net for a score of 3:4. Team Suisse relentlessly demonstrated their vigor while keeping the tempo high in the final period. By the 45th minute, Eric Blum, Reto Schäppi and Tanner Richard had increased the lead to 7:3. Switzerland will face the defending champion Team Canada in the final on Sunday at 12 noon. 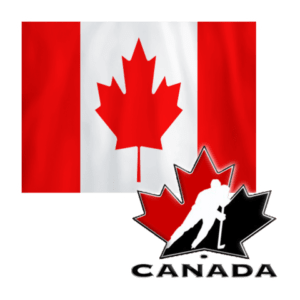 While the Canadians will seek their 15th Spengler Cup win – equalizing the record held by HC Davos – Switzerland has never moved past the quarter-finals in this traditional tournament. 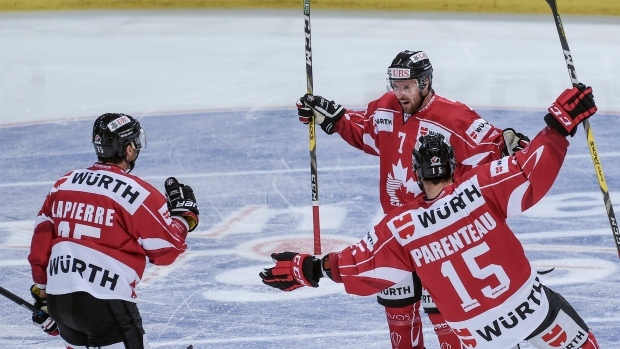 Canada defeated Mountfield HK 5-2 in semifinal play Saturday at the Spengler Cup. Zach Boychuk scored in the third period and Maxim Noreau iced the victory with an empty-net goal. David McIntyre, Jay McClement and Cody Goloubef also scored for Canada. Lukas Cingel and Michal Dragoun tallied for the Czech side. HC Davos is scheduled to play Switzerland in the other semifinal later Saturday. The winner will play Canada — the two-time defending champion — in Sunday’s final. Andrew Ebbett scored twice as Canada beat host club HC Davos 4-1 and advanced to the semifinals of the Spengler Cup on Thursday. Zach Boychuk and PA Parenteau also scored for Canada as the two-time defending champions finished first in their group with a full six points at the pre-Olympic tournament. Kevin Poulin was solid in goal with 37 saves, allowing only Sam Lofquist’s first-period power-play goal. Gilles Senn stopped 38 shots for Davos (1-1, three points), which must now play a quarter-final game against Finnish side HPK Hameenlinna on Friday. Canada will next face the winner of a quarter-final between Mountfield HK and Dinamo Riga. Hockey Canada is using the tournament as a final evaluation before deciding on its Olympic roster in January. What does it mean to represent your country at the Olympics? For Brock Radunske, the question has some nuance given the towering, blond-haired Canadian will be suiting-up for South Korea at the 2018 Winter Games. The ice hockey forward is one of 16 foreign athletes granted South Korean citizenship ahead of February’s Pyeongchang Winter Olympics under changes to the country’s immigration laws that came into effect in 2011. The changes, the Justice Ministry told Reuters, were aimed at boosting competitiveness in sectors such as sport, science and the economy. The key point was that dual citizenship was now an option for those deemed to have “outstanding ability” who could “contribute to the national interest”. The first athlete without any Korean lineage ever to be naturalized, Radunske said it was an “honor” to be chosen for Team Korea but that being able to retain his Canadian passport had been a key factor in his decision. “I grew up in Canada and I‘m proud to be a Canadian, and in a sense I‘m representing Canada too … when I‘m playing for Team Korea,” the 34-year-old told Reuters. Under the previous immigration system, Radunske would not only have had to surrender his Canadian passport but might have been expected to do a 21-month stint in the military. 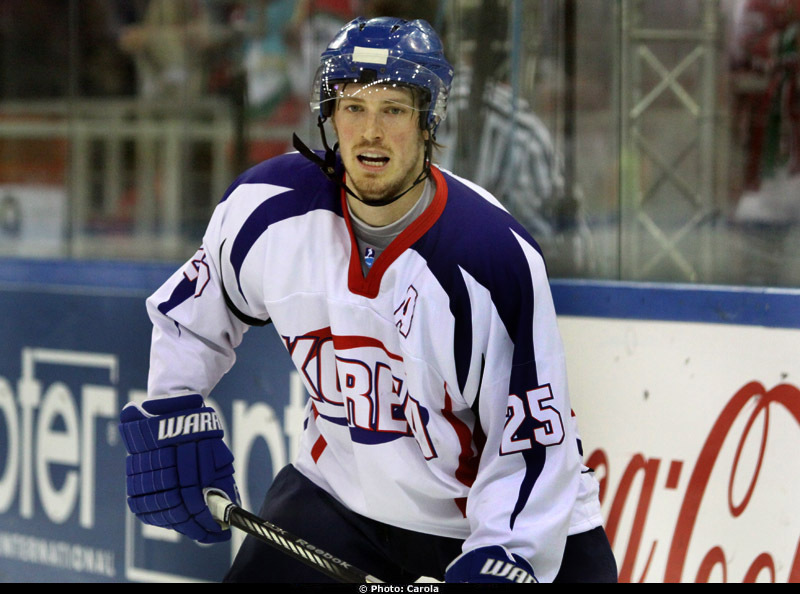 Radunske has played professional ice hockey in Korea since 2008 when he became the tallest player ever to sign for Anyang Halla. The signing was hugely popular with female fans, who fawned over his imposing 6ft 5in (1.96m) frame and good looks. Their nickname for him appears to have got lost in translation, however, with Radunske unlikely to encourage the use of “Canadian Big Beauty” when his playing days are over. A third-round draft pick by the Edmonton Oilers in 2002, Radunske never made it to the NHL and representing Olympic champions Canada was always out of reach. South Korea was therefore an attractive option but becoming a citizen of one of the world’s least ethnically diverse countries was no easy task. Radunske had to pass a battery of tests, including of his Korean language skills and knowledge of local culture and history. His fellow Ontario native Matt Dalton also came through the notoriously difficult process and said his decision to take on citizenship had caused some confusion ‘back home’. “Being in Canada, some people didn’t even know where Korea was,” said the goaltender. At a tournament in Russia earlier this month, Dalton said he had conflicting emotions during the playing of the anthems when Korea took on Canada – as they will in their final group game in Pyeongchang. South Korea will have seven naturalized players on its men’s ice hockey team and forward Park Woo-sang said his team mates had proved their worth on the ice as well as their love for South Korea off it. “We don’t think of them as naturalized players, we think of them as Korean players,” he told Reuters. With around 100 registered professionals in the country, South Korea needed all the help it could get just to secure an Olympic spot in a sport where the hosts are not guaranteed a berth. Previous Winter Games hosts have also relied heavily on foreign-born players to bolster their ice hockey squads. In 1998, Japan’s ‘Seven Samurai’ featured six Canadians and a Swede, while Italy had nine Canadian and two U.S.-born players in their 2006 squad. While more of a factor at Summer Olympics, changing national allegiance has also become prevalent at the Winter Games. Data from the Pew Research Center showed 120 of the 3,000 competitors in Sochi in 2014 represented a country other than the one in which they were born. The IOC imposes a three-year wait period for athletes who want to switch but it has allowed them to cut short the process if their original Olympic committee and governing sports federation agree. South Korea also has naturalized athletes in women’s ice hockey, figure skating, luge, biathlon and skiing set to compete in Pyeongchang, but not everyone is on board with the policy. Roger Park, a professor at Hanyang University’s Sports Industry Department, said the practice could run counter to Olympics ideals. “In most cases, (they) maintain their original citizenship and go back to their original country after the Games,” he told Reuters. Park also questioned the value of the medals they won. ”If these foreign athletes do not have any attachment for or relation to South Korea, what is the point of them competing for the national team? Several Korean sports federations contacted by Reuters said naturalized athletes were offered greater financial support than locals, but declined to elaborate on figures. An official from the Korea Biathlon Union, which has four Russian-born athletes on its roster, told Reuters such athletes were in high demand. “Internationally there is a kind of competition going on to attract athletes who are willing to be naturalized,” said the official, who did not wish to be identified. Ice hockey association media officer Kim Jung-min, however, said no financial package was needed to persuade the players to take on dual citizenship as they were already playing on professional contracts. Kim also rejected the notion that Korea was trying to “buy” a medal. Switzerland is the first team to qualify for the semi-finals at the 91st Spengler Cup in Davos. Without any extra fanfare, they won Thursday afternoon’s game against Hämeenlinna HPK 4-0. Luca Boltshauser gets the shutout in his debut for the Swiss National Team. After their 6:1 win in their first game against Dynamo Riga, Patrick Fischer’s Team had to fight a lot harder for the 3 points resulting from their 4:0 win against Hämeenlinna in front of 6300 spectators in the sold-out Vaillant Arena. The Finns were the better team during the first 10 minutes of the game. The Swiss goalie, Luca Boltshauser, prevented an early lead through several saves. Tristan Scherwey’s goal in the 14th minute was probably one of the first possible shots-on-goal for the Swiss. The forward (from Bern) was able to successfully complete a quick counterattack. Reto Schäppi increased the lead at the beginning of the second period when he deflected a long shot from Yannick Rathgeb. The shots-on-goal ratio during the second period was 10-1 for the Swiss Team. Nevertheless, they were unable to consistently dictate the game against this 14th placed team in the Finnish league. Boltshauser was only tested once during this period, this was not only because the Finns regularly missed the net but also because of the self-sacrificing hard work and well-positioned defensemen of the Swiss team. This was especially clear in the box play phases. Offensively, the Swiss also had some difficulties with the well-structured game of the young Finns under the leadership of Antti Karjalainen. Fischer’s team showed weakness in power play situations. They did not utilize their advantage in several five-on-four situations, even in 41 seconds of five-on-three. Noah Rod and Joël Vermin were able to make the final result clear with shorthand goals in the third period. 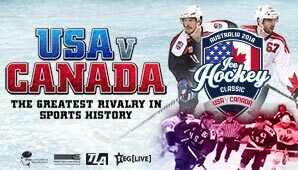 The Ice Hockey Classic is coming to New Zealand with three exhibition games featuring USA v Canada to be held in Auckland, Queenstown, and Wellington – the latter being the first outdoor hockey game to be played at a major stadium in the Southern Hemisphere. Now PUCK YEAH can confirm that the New Zealand Ice Hockey League, plus the Ice Blacks, will be part of the festivities come June 2018. Auckland’s Spark Arena plays host to the first leg of the tour, with the USA and Canada teams touted to feature current NHL players, veterans, and promising young talent. As a curtain raiser to the main event, the Botany Swarm and West Auckland Admirals will play each other in an official NZIHL game that counts towards the league’s standings. Spark Arena is home to the NZ Breakers of the Australian National Basketball League with a capacity of around 8,500 for their home games. The arena also plays host to international recording artists when they come to Auckland – most recently Canadian RnB superstar The Weekend performed his hits to a sold-out crowd. Playing at such a venue is a brand new prospect for the cross-town hockey clubs as they get the chance to showcase their fiercely competitive rivalry to a wider audience than what would normally fit within their home rinks at Paradice Avondale and Paradice Botany Downs. He expects that these games will likely attract a new audience to the NZIHL. “As I often say, I’m yet to introduce the sport to a Kiwi who hasn’t fallen in love with it so hopefully this will serve as a catalyst towards new fans and players,” said Daigle. With 19 players from the Admirals and Swarm currently in the national team’s wider training squad, that round of the NZIHL season will be split over two weekends to allow their players who also represent the Ice Blacks to travel to Wellington and compete against a NZIHL All-Star team for the outdoor game at Westpac Stadium on June 23rd. That All-Star team will be made up of import players from the five NZIHL teams, along with a few Kiwi players added to the lineup if needed. Considering the calibre of talent the league is now attracting in what is typically the off-season for ice hockey in North America, expect the Ice Blacks v NZIHL All-Stars game to be one full of action (and perhaps plenty of goalscoring) prior to the main event. David McIntyre scored the eventual winner while shorthanded in the third period and added an assist as Canada got past Mountfield HK 5-3 on Tuesday in its Spengler Cup opener. Victor Bartley, Curtis Hamilton, Mason Raymond and P-A Parenteau, into an empty net, also had goals for the Canadians (1-0). Barry Brust made 31 saves for the win in net. Andris Dzerins, Oskars Cibulskis and Lukas Vopelka found the back of the net for Mountfield (0-1). Patrik Rybar stopped 21 shots in defeat. Canada is two-time defending champions at the Spengler Cup and are using the tournament as a final evaluation before deciding on its Olympic roster in January. Vopelka opened the scoring for Mountfield midway through the first. Canada tied the game at 1-1 after a shot from Bartley had a weird bounce off the boards and then deflected off Rybar’s skate and into the net. Curtis Hamilton finished off a nice passing play by lifting the puck over Rybar’s blocker to put the Canadians in front 2-1 late in the first period. Mountfield tied it 2-2 with a goal from Cibulskis, but then Mason Raymond put the Canadians back ahead with a shot from the point on the power play at 9:34. McIntyre scored the winner at 13:05 of the third. Dzerins cut the deficit to one later in the period before Parenteau rounded out the attack. Canada was 1 for 4 on the power play and Mountfield was scoreless on three opportunities. The Canadians have a day off on Wednesday before facing host HC Davos in their final preliminary round game on Thursday. Did the Swiss play so well or Riga so badly? The definitive answer to this question will come in the next few days. In any case the Swiss played efficiently. For the first three goals, they only needed seven shots on goal. With pace and stick technique the team of Patrick Fischer overwhelmed their opponent, in which almost half of the Latvian national team plays for. The Latvians earned little opportunities. Mikelis Redlihs had the first noteworthy chance to score, but after three minutes at the score of 0-1 goalie Leonardo Genoni was not worried, and after the first Goal from Rigas to make it 1: 3, it took only 36 seconds until Dominik Schlumpf restored the three goal lead 1-4. For Switzerland, the match against Dynamo Riga was the ideal start into the Spengler Cup. In November, the Swiss had lost in the Karjala Cup tournament against Canada, the Czech Republic and Russia, and in the last ten international matches, the Swiss never scored more than three goals. The Swiss scored two more goals in the game, Luca Fazzini (5-1) and Lino Martschini (6-1), should give the Swiss additional confidence. The Swiss play in the Torriani group on Thursday against the Finns club HPK Hämeenlinna, who play against Dynamo Riga on Wednesday afternoon. The United States have been the topic of worldwide conversation for what seems like a nonstop rotation over the past year. It’s easy to look at everything and suggest changes needed to be made, one way or another. On the ice, though, the team is looking to completely change the script. The country has only had repeat medals twice, but never has been able to win the tournament in back-to-back years like their neighbours north of the border. The World Juniors have been hosted in the United States just five times, with the Americans only medaling once. That one time, ironically, happened to be in Buffalo, home to the 2018 World Juniors and the best chance for the team to grab their second straight title. 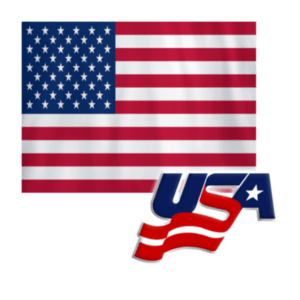 Early indications seem to suggest the Americans will at least earn a medal, but even though they’ll be missing many of the key elements from last year’s team, that won’t likely slow them down. They’re a deep team at every position, featuring stars from the CHL and NCAA. There’s enough fans and scouts that believe that the United States have what it takes to celebrate their newly acquired on January 5th on home ice, something they stole from Canada in a year ago. Offensively, the team has benefited from Logan Brown and Kailer Yamamoto getting sent back to junior after stints in the NHL. Sure, missing Clayton Keller, who’s still eligible for the tournament, hurts for sure, but considering he’s an early favourite for rookie of the year, it’s unlikely he’ll be crying in Arizona. Defensively, USA should have no issue keeping the puck away from the net. The team may not have a lot of players returning to the blue line, but it’s a group chock full of hot hands and strong skaters that will also take advantage of the smaller ice better than their European counterparts. History isn’t on the Americans’ side, at least statistically. But with the quality of success from the US National Team Development Program over the past few seasons and some impactful returning names, the United States truly look like one of the favourites heading into the 2018 spectacle. Goaltending: Whether it be Jack Campbell, John Gibson or Tyler Parsons, the Americans have always counted on their goaltending to keep them in contests that would typically be high-scoring affairs. Parsons, in particular, was lights out in two starts against Russia last year, later helping the Americans to a thrilling shootout victory over Canada in the final. This year, it’s time for his two successors to earn their calling this year, and that’s Jake Oettinger and Joseph Woll. Both goalies had less than ideal starts in the NCAA, but neither have had exceptional goal support, either. By Thanksgiving, Oettinger was 21 in NCAA save percentage while Woll was even farther down in 50th. At this point, there’s no clear favourite as to who will earn the most starts, so expect both options to split starts during the preliminary round. Woll was good in his two starts for USA last year, including a strong performance against Canada in the New Year’s Eve classic. Oettinger, on the other hand, didn’t see any starts for the squad, but as the youngest kid in the crease, that was to be expected. As a first-round draft pick in 2017, however, Oettinger has something to prove and getting the top spot over Woll would be a significant boost in the right direction. If the team does decide to go with Woll, they’ll be getting a 19-year-old Toronto Maple Leafs prospect who stole the show in net at the 2016 Under-18’s. If Oettinger gets the call, they’ll be one of the best USNTDP goalie products in recent years fresh off of being named to the NCAA’s second all-star team in 2017. So while there’s no real favourite just yet, can you really go wrong with either option? Defensemen: With limited returning options this time around, the Americans will be bringing a hungry group with more than enough experience donning the American jersey. Of the tournament sophomores, Adam Fox will be an effective playmaker with a thirst for more ice time after getting used sparingly throughout the 2017 tournament. The all-time NTDP leading scorer for defensemen and the World Junior Summer Showcase points leader is tremendous with the puck and should rack up a fair amount of assists alongside the fast scoring presence the team will be relying on. Fox’s defense partner for much of the summer showcase tournament was Dylan Samberg, a Winnipeg Jets second rounder in 2017. Currently a member of the University of Minnesota-Duluth in the NCAA, Samberg’s shutdown nature will be more effective when paired with a more offensive dynamo like Fox. Samberg isn’t a guy you’d expect to see in the NHL anytime soon (playing college hockey doesn’t totally help disproving that) but his raw talent and his fluent skating for his size makes him a prototypical defenseman you want patrolling your blueline. Michigan’s Quinn Hughes has had a good enough NCAA campaign to earn himself considerable ice time. An expected top ten pick in the NHL this year, Hughes was nearing a point per game in the NCAA for the first few months, something he teetered around with in the USHL last year with the USNTDP. For USHL defensemen two seasons ahead of their draft eligibility, Hughes is the all-time leader in points under that circumstance. His 26 points in 26 games last season beats out big names such as Charlie McAvoy, Brady Skjei, Noah Hanifin, Seth Jones, Zach Werenski and Jacob Trouba. Hughes comes from an incredible hockey background, with 16-year-old brother Jack expected to go in the first few picks in 2019, while his youngest brother, Luke, could get drafted in 2021. Nashville Predators third-rounder David Farrance is an interesting case for the Americans. An injury replacement in the summer, Farrance can move the puck better than most others at the tournament. He had nothing to lose when he was added to the team in August but had fantastic results to show for it, earning praise from coaches and scouts a like. He hasn’t put up big numbers with Boston University in his rookie season, but Farrance looked good enough over the past few years to know by the end of his time with the team, he’ll be a force at the college level before eventually turning pro. And let’s not forget Charlie Lindgren’s brother, Ryan Lindgren. The University of Minnesota sophomore should be able to double his point totals in college this year and while he’s not an offensive threat, he’s going to keep the puck away from the net. Just one of two returning players on the blue line, Lindgren will hopefully be a leader for a team with so much young potential, but with a lot of inexperience at this level. There aren’t a whole lot of bad options for the Americans on defense, and with the team on home ice, they’ll need to be stellar. Forwards: Like Canada, there’s always more than enough discussion about the players that aren’t taking part in the two-week bonanza. But with Brown and Yamamoto coming back into the fray after starting the year in the NHL, there’s an added belief that the Americans could have one of the most dangerous lines in the entire tournament. It starts with Brown, a 19-year-old centerman that skated in four games with the Ottawa Senators this year. Easily the top player on the Windsor Spitfires, Brown should finish with a career-high in points despite not starting the season in the league. In fact, he’s on pace to outdo his 40-point season from a year ago in five less games. The fact that he put up 12 points for the Americans at the 2016 Under-18’s and still wasn’t the team’s top player shows how good the Americans have been developing prospects in recent years. Then there’s Yamamoto, perhaps one of the most surprising names to make the NHL this season. A speedy forward that produces magic with the puck, Yamamoto had three points in nine games with the Oilers out of training camp before getting sent back to the Spokane Chiefs. Yamamoto finished with seven goals (the most of any player) and 13 points at the Under-18’s two seasons ago, an impressive result for a bronze medal squad. Yamamoto may not be a big player, but he has a history of getting himself in trouble in international tournaments in the past and that’s likely a big reason he didn’t get a shot with the World Junior team last year after a so-so summer showcase. Of course, we can’t forget Buffalo Sabres prospect Casey Mittlestadt, the third member of the dynamite trio from the World Junior Summer Showcase this year. Mittelstadt could stickhandle is way out of a traffic jam and is one of the best players at his age at playing a two-way system. Mittelstadt is off to a great start with the University of Minnesota and unlike his two potential linemates, he hasn’t had to adjust to different systems a few weeks into the season. After USA’s top trio, which produced 20 points in the five-game tournament, the team still manages to keep the lines looking spiffy. Last year’s team had some star forwards in the top six, but some of the bottom six, which included guys freshly drafted into the NHL, had 18 year olds who couldn’t finish the job. An extra year of development has proven huge for Patrick Harper. Harper only has a single point a year ago, but the Nashville Predators prospect finished third in WJCSS scoring with seven points and has lead Boston University all year long. Same goes for Joey Anderson, who, despite being a solid defensive forward last year, didn’t add much offensively to the squad. An injury early in the season took him out of action to start the season, but his game has quickly picked up and his stock has improved. The Montreal Canadiens may be a team destined for failure this year, but Ryan Poehling is a kid with incredible potential for the future. The St. Cloud State University center has developed into an important player for his school, beating out his previous season total before December began. While he isn’t a fast skater, Poehling is tough to knock off the puck and he’s got the ability to be put in pretty much any situation thanks to his tremendous work ethic. Two other names worth watching are Kieffer Bellows and Max Jones. Bellows made the transition to the WHL after a so-so rookie campaign with Boston University and is on pace for around 75 points as a 19-year-old. A first-round pick by the New York Islanders, Bellows looked good last year but the team was expecting a bit more out of him. For Jones, the Anaheim prospect hasn’t represented USA since the 2014 Under-17’s, a tournament where he finished with seven goals to lead the tournament. The London Knights forward doesn’t put up incredible offensive numbers, but, as evidence by his 13 goals and one assist in his first 19 games, it’s clear he’s good at one thing: goals. What wins games? Goals. Projection: The United States have to win, period. Hockey is on the rise in the country and could surpass Canada sooner than later in participation numbers. With a championship on Canadian soil last year, the last they’d want (outside of a relegation round appearance) is to lose to their border buddies on home ice. The battlefield is set for a December 29th outdoor game, a contest that could set the stage to see who wins Group A. Will we see a second battle when the medal round heats up? There’s a very good chance, and if you had to bet, USA has enough strong depth at every position to be a true number one contender in Buffalo. No country cares about the World Juniors like Canada. It’s a year long event, really. It begins with message boards lighting up after the gold medal game the previous year with predictions of who’ll grace the team the following December. TV specials make a splash in the weeks leading up. There are people dedicated to following what happens to the young kids all year, just to see how they perform for their country for two weeks. Canada hosts the World Juniors every two years, with Toronto and Montreal sharing it in 2015 and 2017. 2015 broke a streak of bad luck for Canada at the World Juniors, with their last gold medal coming in 2010 before that. It looked like the 2017 medal was theirs, too, with the hosts taking the 4-2 lead early in the third. And then they lost. In the shootout. To the United States. It doesn’t get much worse for the boys in red. This year, the team returns with another strong group to work with. To start, they have one of the best goalies in Carter Hart. The talent on the blue line is hard to match, and if they were able to get some help from the NHL, they’d be unstoppable. On forward? Sure, no Dylan Strome or Jordan Eberle, but they’ve got one heck of a group to work with. But skill doesn’t always trump teamwork, and they’ll need to be fluent as a unit if they are to beat out the likes of Sweden and USA. Canada has the skill, but can they hold themselves together in one of the most northern cities in the eastern United States, Buffalo? Goaltending: Unlike in recent years, Canada decided to bring four goalies to training camp to find out who really was the hottest hand heading into the tournament. With nobody finding a way to stop Carter Hart this season, the WHL’s top goalie is well on his way to be a finalist for the league MVP and, hopefully, a long future with the Philadelphia Flyers. Prior to getting named to the team, Hart had back-to-back Goaltender of the Week honors, giving him 12 since 2014. Hart started as Canada’s top goalie a year ago, only to have Tampa Bay Lightning prospect Connor Ingram steal the top spot midway through. Hart, however, would reclaim his spot when it mattered the most, putting up great performances all the way to the gold medal game. He didn’t have a good summer showcase and fought an illness at the start of the season, but Hart has rebounded in ways that make it tough to believe he won’t be their guy going forward. They do have a good backup option if things go south, however. Colton Point has the rare situation where Point’s lone tournament experience with Canada was at the 2015 World Junior A Challenge, where he struggled with Canada East, who performed below standards. Still, Point had some bright moments during the pre-tournament camp and has been fantastic with Colgate University in the NCAA, pushing future starter Michael DiPietro off the team. He just needs to be good if he’s called upon for a game during the round robin. Defensemen: With the tournament within weeks of beginning, there was still uncertainty as to whether Canada would get access to Victor Mete, arguably one of the best defenseman under the age of 20. If he didn’t come, the team had enough skill defensively to make up for the missing talent, and that’s something very few teams have the ability to say. And then just before the World Junior camp opened up in St. Catharines, Canada got their wish: Mete was coming. After spending the first few months of the season with the Montreal Canadiens, including some time with Shea Weber, Mete comes in with top end experience and incredible composure that playing at a tournament like the World Juniors will only continue to boost his profile. Mete’s a great skater that doesn’t force offensive plays and always lands back in his proper position defensively, a strength of his from his minor midget days. He’s improved mightily in the past calendar year and has proven that his size doesn’t matter when it comes to his defensive play. Brandon Wheat Kings defender and LA Kings prospect Kale Clague may simply be the best defenseman in the entire CHL. A tremendous two-way defenceman on pace for around 80 points this season, Clague has the skill the deke your pants off and knock down bigger opponents, giving him all the tools needed to be a future NHL star defenceman. The second top scoring d-man on the Canadians a year ago (trailing tournament MVP Thomas Chabot), Clague will likely be Chabot’s replacement ice-time wise, with expectations that he’ll hit around 30 minutes a night some games. It’s unfair to think that Nashville has Dante Fabbro in their prospect stable, but here we are. One of the best players to get drafted out of Junior A, Fabbro has been a treat to watch every time he’s played for Canada internationally. Currently in his second NCAA campaign with Boston University, Fabbro is a two-way defender capable of putting up high offensive output and his shot is one of the best on Canada’s blue line. His 2015-2016 season was a big one for him internationally, winning the Hlinka Memorial and World Junior A Challenge while also leading the Under-18’s with the most assists by a defenseman with eight. With a silver medal under his belt at the World Juniors, there’s only one more thing to achieve: a gold. The World Junior A Challenge helped Fabbro make a name for himself, and it also played a role in the development of Cale Makar. Makar had a legendary tournament last year for Canada, getting named to the all-star team after recording five goals and nine points in eight games. In fact, he is tied with Deron Cousens for the most points by a defenceman at the tournament, which also beats out Fabbro, too. Makar has been a fantastic freshman play maker with UMass this season, recording nine points in his first 15 games after getting named the AJHL’s Most Valuable Player a year ago. Makar will get a big role for Canada and it should be expected to see him get some power play time. With Jake Bean and Cal Foote, it’s hard to go wrong if you’re Canada. Bean is expected to slot in to Carolina’s top four in a couple of seasons and a good year with the Calgary Hitmen is giving him more confidence playing big minutes. A smart blue liner who makes good decisions away from the puck, Bean has put up good numbers in the WHL, mostly due to his aggressive attacking style with his stick. Bean played at last year’s World Juniors so the coaching staff knows what he can bring, and that’s important in a short tournament with very few opportunities to prove yourself. For Foote, Tampa Bay’s first-round pick this season, the son of former NHLer Adam Foote could finish with his best season with the Kelowna Rockets, the team currently wears the C for. Foote creates offensive plays from behind and he makes life miserable for his opponents. Foote is exactly the guy you want in spurts when you have a loaded D core and he’ll be counted upon big time when the tournament heads closer home out west in 2019. Forwards: Three forwards return to Canada’s lineup with, with Tampa Bay prospect Taylor Raddysh leading the way. Raddysh was fantastic in a lesser role last year, scoring a hat-trick against Latvia and finishing with six points in seven games. The OHL’s leader in assists last year with 66, Raddysh was among the top ten OHL scorers by the time Canada announced their training camp roster and could still finish near the top, even with going to the World Juniors. Raddysh should be one of Canada’s top two wingers and could challenge for the tournament leading scorer honor. For Michael McLeod, the former 13th forward and current New Jersey Devils prospect has been stellar since returning to the Mississauga Steelheads in November following an early injury. McLeod had two goals and an assist in a minor role last season, but don’t expect the play making center to get limited minutes again for Canada. He’s never been a big scorer for his country in international play, but this is really his best chance in the spotlight. There’s also Dillon Dube, the WHL scoring whiz that’s on pace to blow any of his previous WHL seasons out of the water, statistically. A second-round pick of the Calgary Flames, Dube had three assists in last year’s tournament and his defensive play was noticeable from the start. He’s quick, tough to beat around the boards and sets up teammates with ease. Dube will bring leadership to a team with very few returning forwards and that should help earn him important ice time. OHL-leading scorer Jordan Kyrou has been hot right out of the gate, and he’ll factor into Canada’s goal-scoring charge. With 54 points in 27 games played at the time of getting named to Canada, Kyrou was far and away the best offensive threat in the league and the St. Louis Blues prospect is bound to make the jump to the NHL next season. Kyrou was a shining force at the 2014 Under-17’s and 2016 Under 18’s for Canada and his two-way play makes him valuable in any situation at any end of the ice. A year ago he led the entire WHL with 131 points, yet he didn’t make the World Junior team. This time, Sam Steel will be one of Canada’s most important wingers thanks to his ability to make anyone look dumb with smart, accurate, dangerous plays both with the puck and without it.may not have the best point total this season, but there’s nothing stopping him from having his way with Group A. A healthy scratch on many occasions in his OHL rookie season with London, Robert Thomas has since emerged into a first round draft pick of the St. Louis Blues playing his best hockey of his life. One of York-Simcoe Express’ top players at the OHL Cup back in 2015, Thomas hasn’t really been a major factor in important tournaments since then (only one point at both the 2015 U17’s and 2016 Memorial Cup, but he’s shown steady improvement over the past few years. This will be just his second tournament for Canada, but he has the tools to be a decent third line centerman for the boys in red. One of Canada’s most underrated forwards is Tyler Steenbergen, Swift Currents superstar forward. In just 27 games with the Broncos this year, Steenbergen had a whopping 61 points which is well on his way to beat his 90-point total from a year ago. Steenbergen has an incredible shot and is a guy you’d want to act as Alex Ovechkin on the power play, ripping hard shots from the wing. A lower body injury took him out of action before camp, but the Arizona Coyotes forward is ready to show why every Canadian team at every level previously made a mistake not taking him. The whole forward group is filled with immense talent, and Jonah Gadjovich is a guy that brings an edge to his game yet has speed to kill. Gadjovich doesn’t have the crazy offensive numbers some of his teammates possess, but his two-way, team-first style of play makes him tough to miss. He’s come a long way since his nine point season to kick off his OHL career and the Vancouver Canucks hope he becomes a potential Milan Lucic some day. Canada’s toughest question will be trying to figure out which players, who typically score for their junior teams, are best playing more defensive roles instead. big two-way forward Brett Howden can score, hit and play in any situation. A fan-favorite in Moose Jaw, Howden’s upper body injury in December wouldn’t keep slow him down and he should be good at winning faceoffs in tough situations. Anaheim Ducks prospect Maxime Comtois is a was a bit of a surprise to make the team, but given his previous succes with the national team, the team knows him well. He’s shined at the Hlinka Memorial and the Under-17’s in recent years, and his aggressive style makes him a feared opponent. Just ask Denmark; Comtois was a bowling ball during many of his shifts. In short, Canada has more offensive weapons than almost all of their competitors. This is typically the case, and even without a clear number one star to focus on, the depth of the forward group can’t be ignored. Projection: Projecting Canada as a medal favorite is too easy. They’re always strong and have depth that’s tough to top. Any time the tournament heads to the United States, there’s a bit more pressure to pull off a title. The Americans may be strong right now, but it would be surprising to not see Canada back in the finals once again.